Looking west directly across the breach at low tide. The Atlantic Ocean is to the left with Bellport Bay to the right. 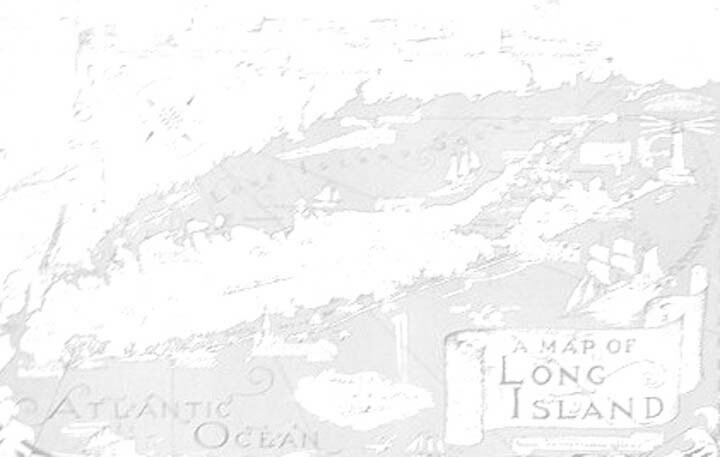 Mr. McAllister, president of Peconic Baykeepers, will provide a perspective with regard to the ecological advantages of additional sustained flow between the ocean and Great South Bay. Peconic Baykeeper is the only independent not-for-profit advocate solely dedicated to the protection and improvement of the aquatic ecosystems of Peconic and South Shore estuaries of Long Island. As sprawl development continues to harden the island's landscape, pollution threatens the vitality and health of our bays. Their recovery depends on kinds of enlightened costal management policies and responsible development practices that can be adopted when citizens and communities are informed and engaged in decision making. Mr. Gagliano will share his perspective as it relates to the actual effects being experienced along the Bellport Village shoreline post Sandy. Bellport Village lies directly opposite the breach on Fire Island less then two miles away. Representatives from shoreline communities, municipalities, and organizations who will share their perspectives with regard to the actual effects that the breach is having on the shoreline post breach. Please arrive 25 minutes early if you wish to sign up for the public comment period. 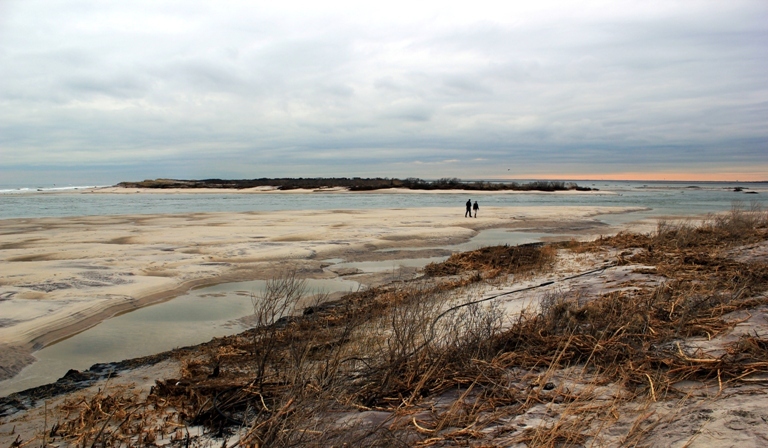 Marine experts say a Sandy-caused breach in the Fire Island wilderness area should be left alone, despite calls to close the gap by politicians concerned about flooding on Long Island's South Shore. A rash of severe nor'easters -- not the relatively small inlet -- is responsible for major coastal flooding in recent months, the experts said Saturday at a Bellport forum. 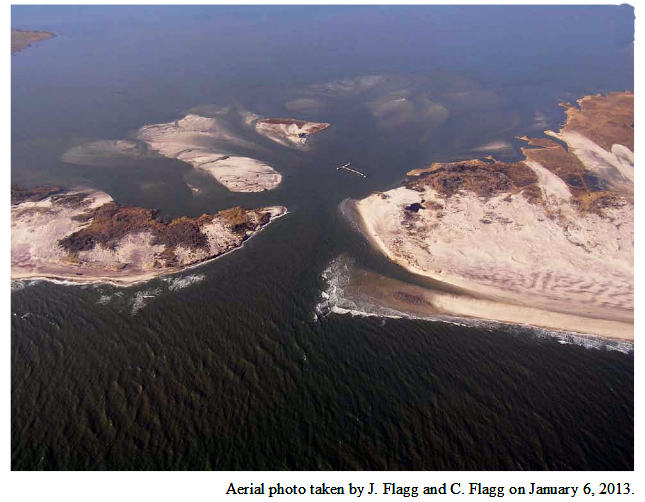 Thanks to the breach, the experts said, bays between the South Shore and Fire Island are cleaner than they've been in years. 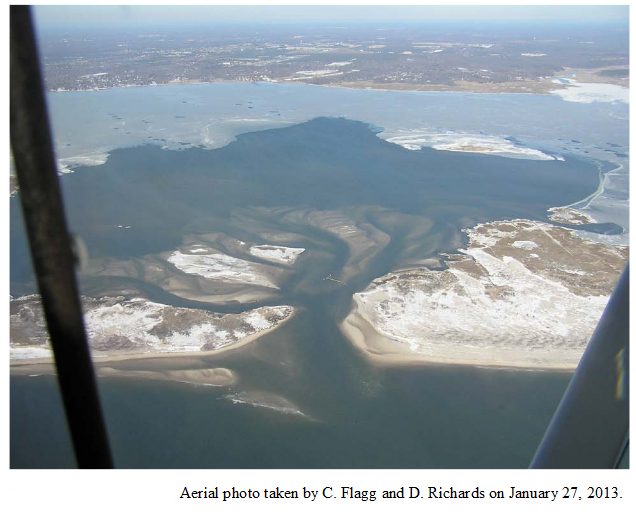 "The inlet is small compared to other inlets in the Great South Bay and, as a result, it allows only a small amount of water into the bay," said Charles Flagg, a research professor at Stony Brook University's School of Marine and Atmospheric Sciences. Flagg gave a lengthy presentation that detailed the many changes that have taken place since the breach opened, along with a rise in salinity and a drop in harmful nitrogen levels. 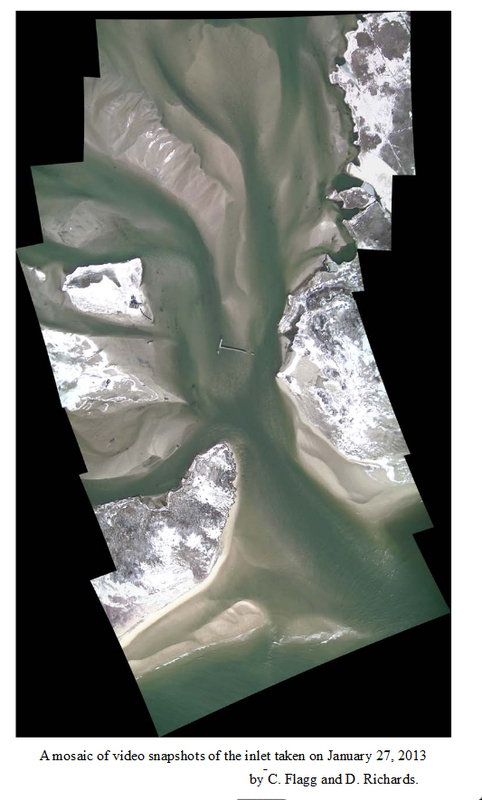 Tidal activity on "the entire coast, as well as the Great South Bay, is going up and down as a result of these large-scale storm events . 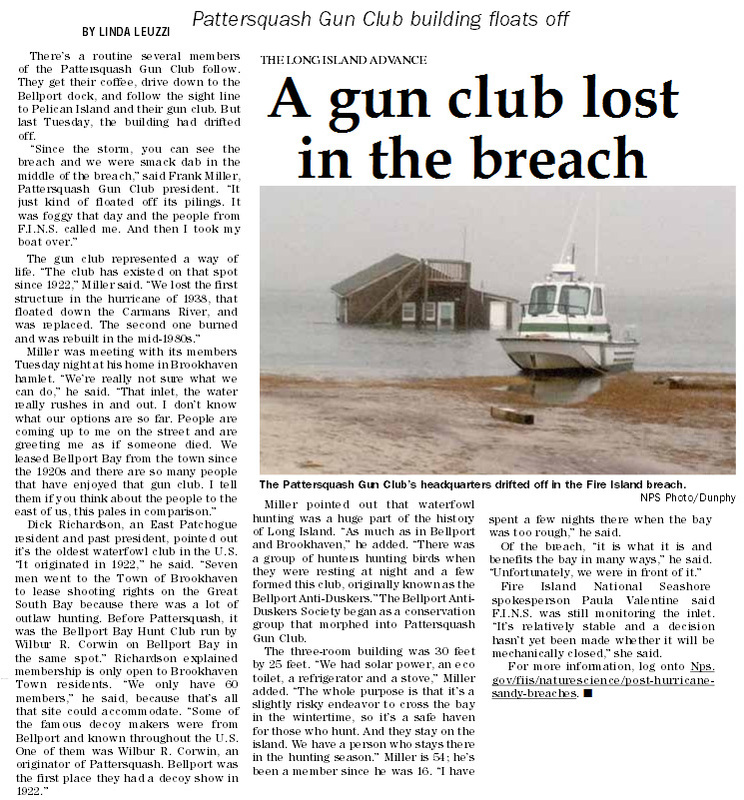 . . and the inlet has nothing to do with what's going on in the bay," Flagg said. The three-member panel, which included Peconic Baykeeper president Kevin McAllister and Bellport Village Waterfront Commission chairman Joseph Gagliano, said the circulation of ocean water into the bay could also revive shellfish populations. "This is a back bay area that will benefit . . . from ocean water coming in and flushing," McAllister said. The roughly 300 people packed into the Bellport Middle School auditorium applauded the speakers, with some in the crowd holding signs reading "I [Heart] New Inlet." One poster in the hallway bore the phrase "Inlet It Be." "I hope when it's all said and done, we listen to the marine science people, and not the political science people," Gagliano said. During a public comment portion, dozens spoke in favor of leaving the inlet open. But Mastic Beach resident Michael Hartnett, 54, said his neighborhood has been sitting in water since the breach opened. "We haven't had good dry ground since Sandy," he said. "I would love to see the water clean, too, but I don't want to see it at the expense of my community." 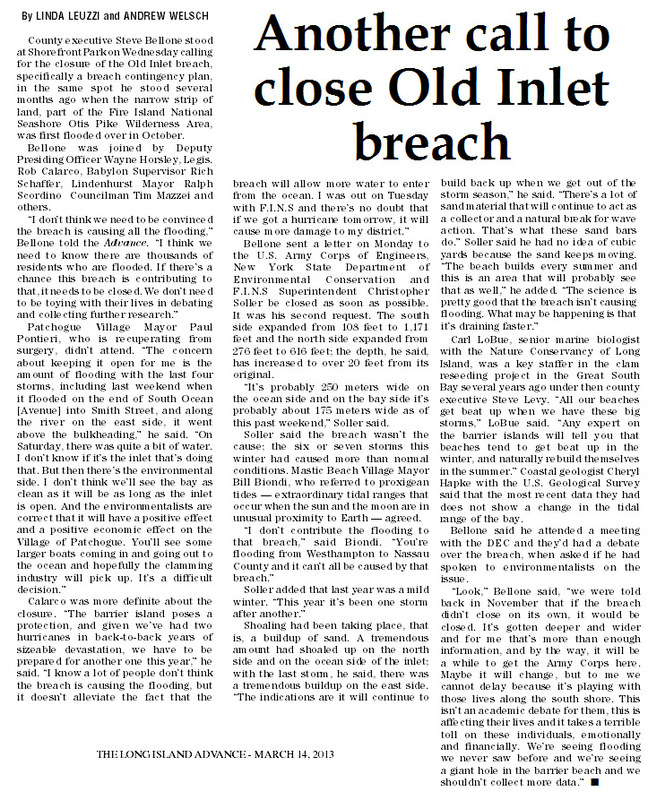 Suffolk County Executive Steve Bellone and other local officials have demanded the breach be closed, citing unprecedented South Shore flooding.